Pineapple Decor is found in many homes in the south and that’s especially true in Charleston. The traditions surrounding using pineapples to show hospitality are varied, but they all involve welcoming guests into our homes. 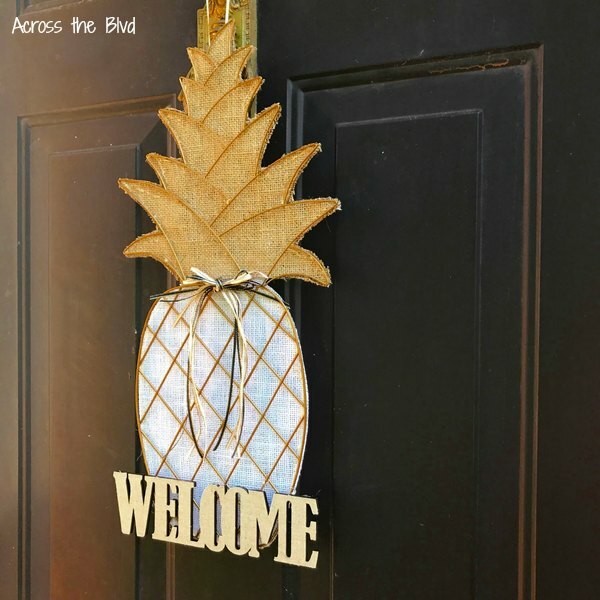 Making a Welcome Pineapple Door Decor piece was a simple craft that took very little time and it’s a great alternative to a traditional door wreath. I bought this wire pineapple at JoAnn Fabric & Craft several weeks ago. There was a display of them right at the front of the store and they were on sale for 50% off. 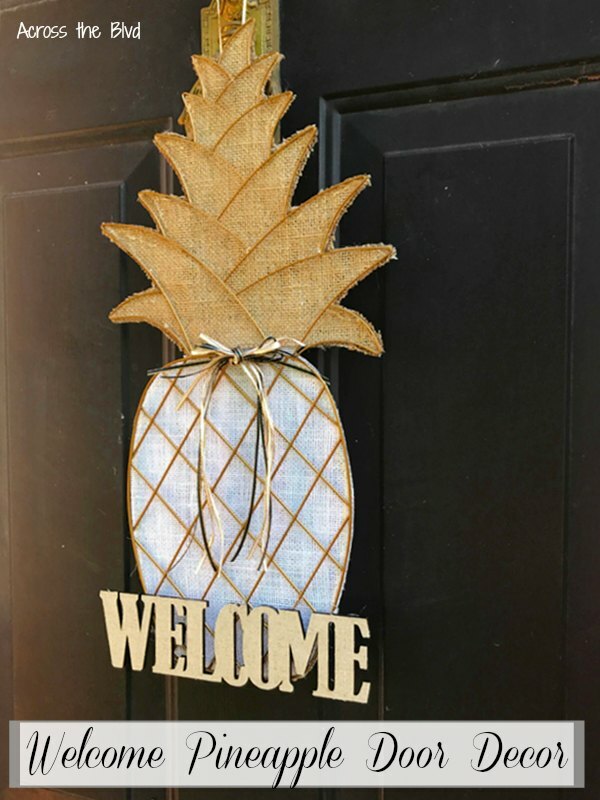 I wasn’t sure what I would do with it, but since I love pineapple decor, I knew I could use it for something! 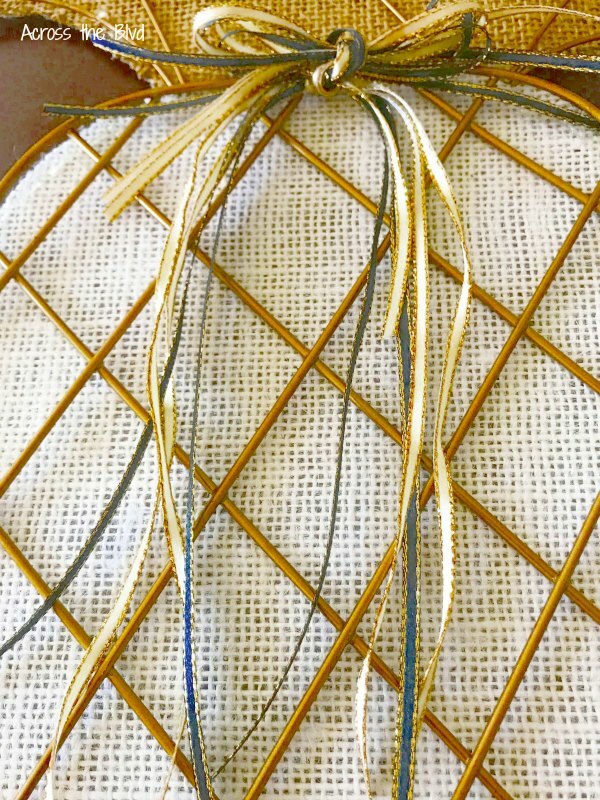 I used strips of narrow ribbon, one in gold and one in blue to add a bow. I tied off several strands of it around the wire in the center and then used more strips to tie a simple bow. I glued the bow in place using Gorilla Clear Grip Glue. The wire pineapple was a little too plain, so I wanted to dress it up by using a backing. After looking through items I had on hand, I decided on using a piece of burlap for the top and a creamy colored laminated canvas sheet for the bottom. 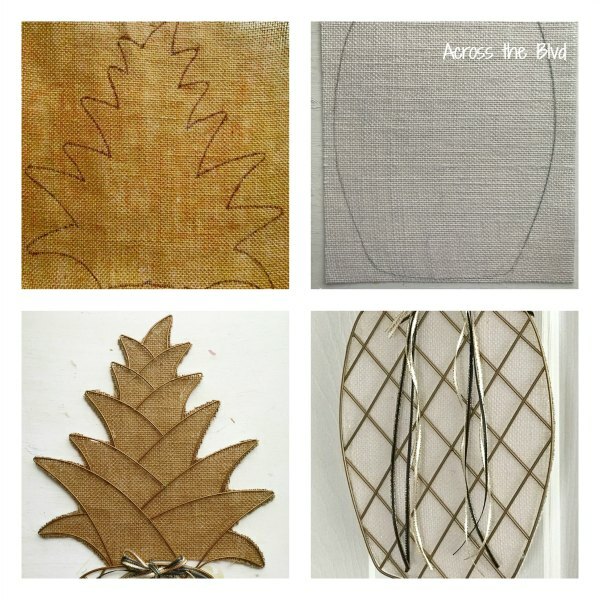 I placed the pineapple over the fabric and used a pencil to trace the shape. I cut out the shape and trimmed it down to fit behind the pineapple. Since I’ll be using this on our front door, I needed waterproof glue. The representatives from Gorilla Glue at Haven Conference were generous in supplying products to us, so I tried it out for this. 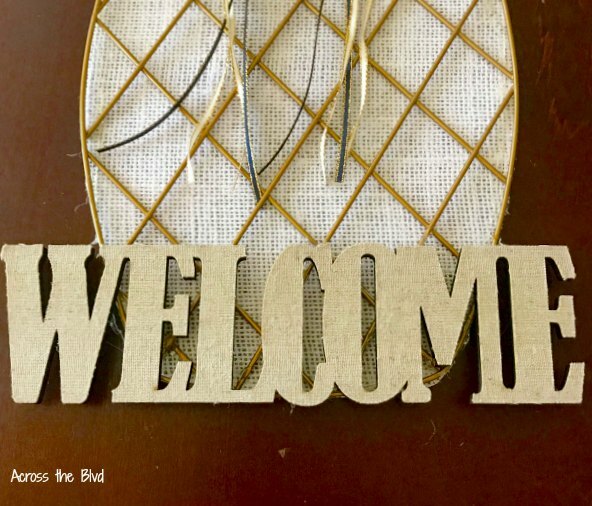 After trimming off some of the excess ribbon, I used the same glue to adhere a burlap covered Welcome sign to the front of the pineapple. This was an easy craft to put together and it took less than 15 minutes from start to finish. The burlap frayed a little, but I decided it makes it look more leafy! That, or maybe I decided I didn’t want to risk burning the metal pineapple frame by using a candle to stop the fraying. Using pineapple decor is common in Charleston. I have several pieces that I enjoy in our home. It’s a sign of hospitality. There is an old folk tale here that says that guests in your home should be greeted with a fresh pineapple. Once the pineapple begins to turn, the guests should know that they are about to overstay their welcome! Want to get the latest from Across the Blvd? Sign up below to receive our posts and newsletters via email! I love pineapple decor! This is really cute and creative! Thanks, T’onna! 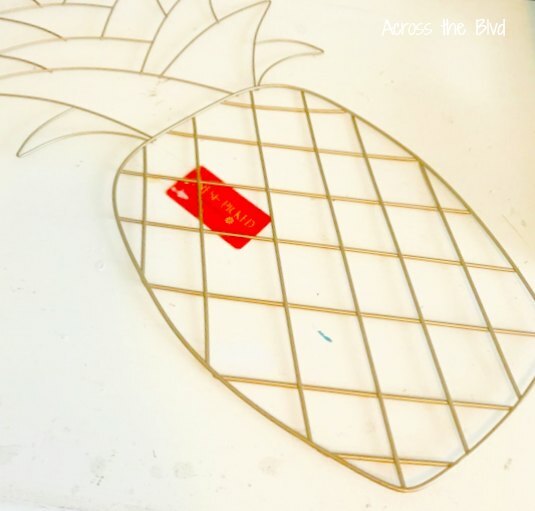 I love pineapple decor, too and was happy when I spotted the gold one that just needed some embellishing. Oh, my crazy pineapple loving friend would absolutely adore this!!!! What a lovely way to welcome friends and family! 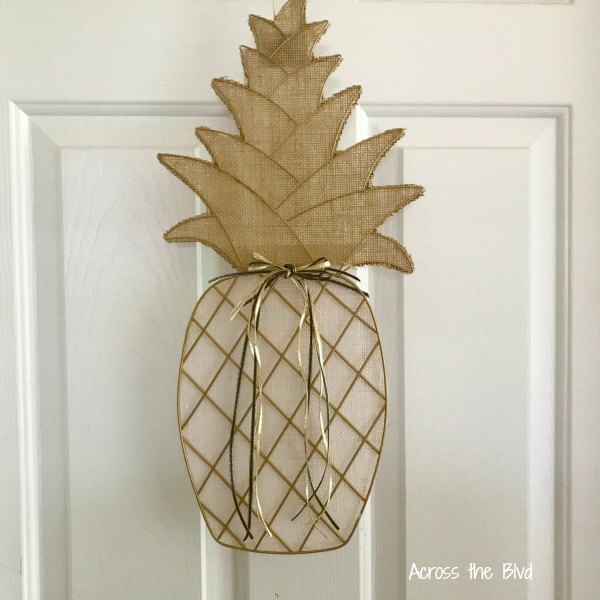 Thank you so much for sharing your cute Pineapple Door Decor with us over at waste not Wednesday! Ha! I love using pineapples in my decor. Thanks for the party, Sam! 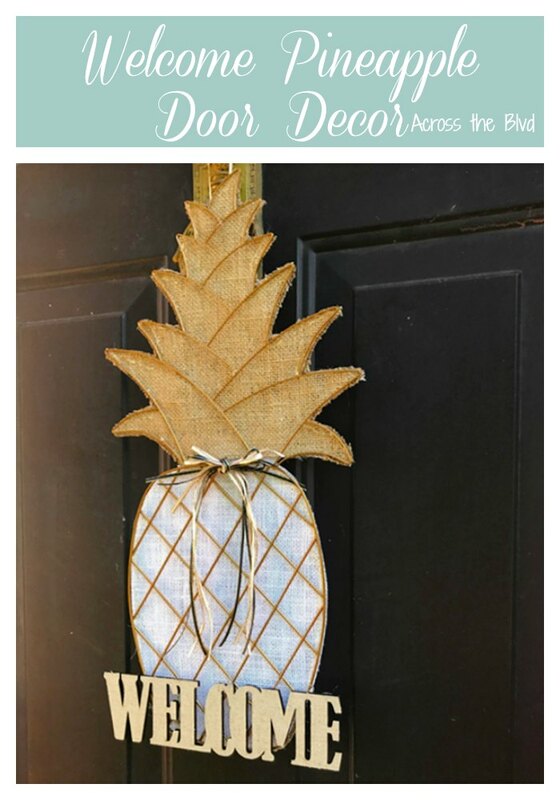 Beveryly, I love this Pineapple door decor! I made it a feature at this week’s Whimsical Wednesday. Thanks so much for linking up! Thanks so much, Michele! I appreciate the feature and party each week. This is adorable. Create idea. Thanks, Linda, I love all things pineapple. I appreciate the FB share.